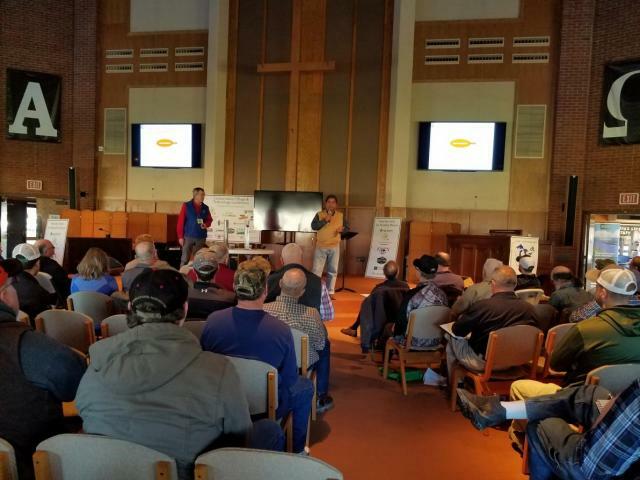 Several members of our Soil, Water and Bioenergy Resources Program staff participated/attended 2018 Building Soil Health, Regenerative Agriculture, and Healthy Foods from Healthy Soil sessions of the Conservation Tillage & Technology Conference Annual meeting (CTC) held at Ohio Northern University in March. The Healthy Soils for Healthy Waters (HSHW) program is a continuation of a series that began in Columbus in 2014. The most recent HSHW programs were in Denver (2017) and Memphis (2016). On the first day, overall topics included Building Soil Health, Regenerative Agriculture, and Healthy Foods from Healthy Soil. Fifteen speakers and panelists included: Barry Fisher (NRCS), David Brandt (Farmer), Rick Cruse (Iowa State Univ. ), Rafiq Islam (OSU), David Montgomery, and Britt Burton-Freeman. Rafiq Islam along with Alan Sundermeier (OSU Wood County Extension Educator) delivered a presentation entitled “Testing and management recommendations of soil health characteristics” on the first day in a two-day session on the Healthy Soils for Healthy Waters at the chapel of the Ohio Northern University. More than 250 people including farmers, educators, consultants, state and federal personnel, students, and non-profit personnel from different states and Canada attended the session. One CCA credit (0.5 for Certified Livestock Manager, CLM and 0.5 for Soil and Water, SW) was by the participating educators for their professional development. Dr. Vinayak Shedekar, along with Alan Sundermeier and others, moderated the HSHW session for both days.